A historic baseball stadium called home by some of the game’s greatest players, including Jackie Robinson, Gil Hodges, Duke Snider and Pee Wee Reese, has a new facelift that will include new sod and a custom baseball stadium scoreboard from Watchfire Signs. Danville Stadium, in Danville, Ill., was built in 1946 to host the Danville Dodgers, a farm team of the Brooklyn Dodgers. Used as the setting for the ballpark scenes in the 1991 movie “The Babe,” Danville Stadium today is owned by the city of Danville and hosts local teams from area schools and organizations, as well as the Danville Dans, a collegiate summer team in the Prospect League. The new scoreboard structure features a 10’x36’ fixed-digit scoreboard and an 8’ by 36’ 16mm video display from Watchfire. The scoreboard is designed to retain the classic feel of the historic Danville Stadium while the video display offers the digital experience that fans and players expect at modern sports venues, according to Dave Warns, Watchfire’s vice president of on-premise sales. The official scoreboard lighting ceremony is scheduled for June 9. Watchfire and Danville Stadium have a long history. Watchfire manufactured a bulb-based message center for the stadium in 1996 and created an LED video display that was installed in 2007 alongside the stadium’s scoreboard. The video display was used to show player headshots and stats, as well as upcoming events and sponsor logos. Both the fixed-digit scoreboard and message center reached their useful lifespans, and in 2017 the stadium was forced to use a paper scoreboard system that was updated by hand. Watchfire worked with Bendsen Signs & Graphics in Decatur and Offutt Development on the design and installation of the board. 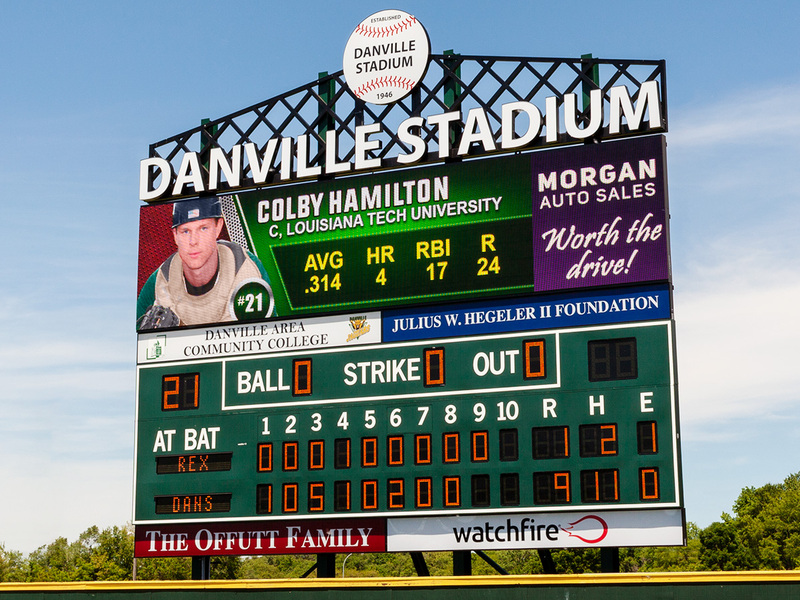 In addition to Danville Stadium, Watchfire has produced video displays to complement fixed digit scoreboards at stadiums across the United States, including baseball stadiums for the San Jose Giants and Lamar University, and the University of Dayton’s football stadium. Earlier this year, the company acquired Buffalo-based HD Sports Boards, a nationally recognized designer and integrator of scoreboards and sports video displays to accelerate its growth in the sports signage market. Watchfire has a line of fixed-digit and virtual scoreboards for any stadium application. Read this guide to learn about revenue-generating opportunities that position a new video display or virtual scoreboard to pay for itself.